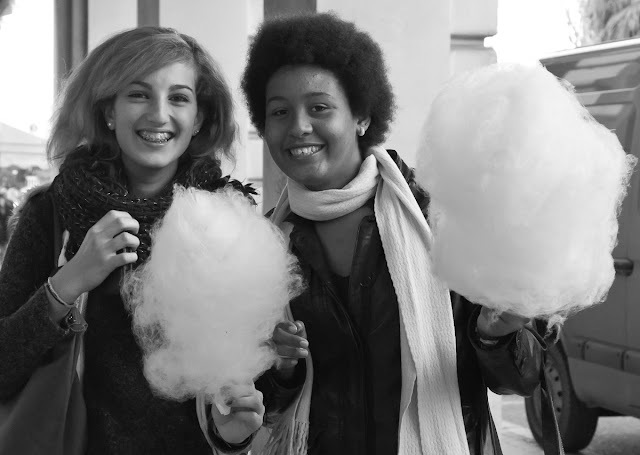 Two beauties enjoying their candyfloss and, in the smaller photo, the ever-smiling lady who makes it. Deux beautés appréciant leur barbe à papa et, dans la petite photo, la dame toujours souriante qui les fait. They certainly look young and happy. 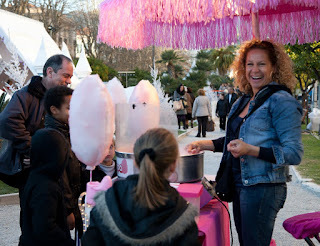 I hope they floss after the candyfloss. we call it cotton candy here. i, of the insatiable sweet tooth, used to adore it as a child. i'm not certain how i'd feel about it these days. Ooh, you make it look sooo good! 2 + 1 gorgeous smiles !